The die is cast. 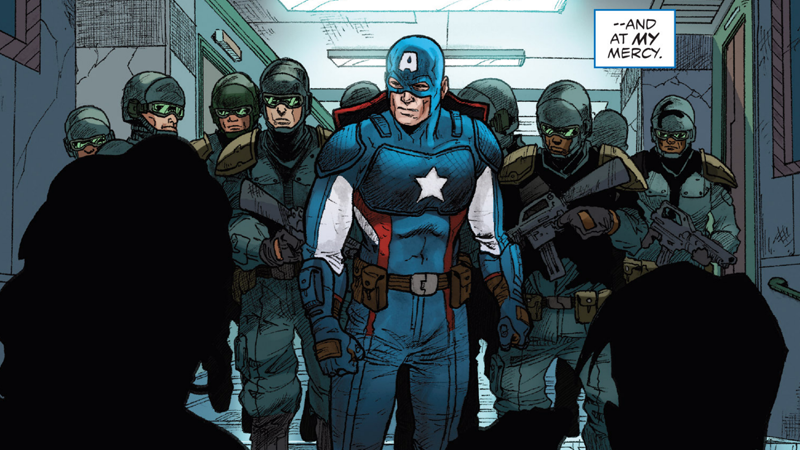 After months of working covertly to bring his plans as an Agent of Hydra to fruition, Steve Rogers, the original Captain America, has made his first big step toward the incoming Secret Empire event. And even though we’ve been waiting for this to happen, it’s a pretty surprising move nonetheless. Today’s issue of Captain America: Steve Rogers #15—by Nick Spencer, Javier Pina, Andres Guinaldo, Rachelle Rosenberg, and Joe Caramagna—picks up where the recent arc of Uncanny Avengers left off. The Red Skull is in custody, and the part of his brain infused with Charles Xavier’s brain matter (oh boy is this a long story, but yes, the Red Skull got psychic powers because he grafted part of Professor X’s brain onto his own after Charles died in Avengers vs. X-Men back in 2012, but anyway!) is removed and returned to the X-Men. With a little help from Steve Rogers, Skull flees from the Unity squad’s captivity to his home—thinking he’s been saved by his loyal agent. He hasn’t. Instead, Steve is now taking his chance for revenge against Skull—revealing that he knows Skull altered his past with the cosmic cube, but instead of thinking that Skull has made his life a lie, Steve just thinks that Skull’s machinations revealed his own “true” self. A self that believes in a pure form of Hydra that the Red Skull corrupted and turned in on itself all the way back in World War II. Through flashbacks to Steve’s altered past, we witness the moment Steve realizes that Skull has subsumed Hydra into the Nazi regime, under his own control, and the organization he thought he’d grown up into had been decimated, played against itself while Skull swooped in to take it all over. In the past, Steve bent the knee and swore fealty to Skull’s new rule. In the present—now that Skull no longer has Xavier’s telepathic powers—Steve can finally tell Skull himself that his own perfect Agent is betraying him. We know that by Secret Empire, Steve is at the head of Hydra, rather than Skull. Today, we know how he got there... because Captain America has just murdered one of his oldest foes, tossing the Red Skull out of the window to his doom. Sure, this is comic books, so Red Skull could come back through many means. But for now, yeah. He’s pretty damn dead. So yes, everything is coming to pass as we expected. With the Skull out of the way—and an international crisis looming, as also in this issue we learn that Hydra has taken over Sokovia and is nuclear armaments, threatening to launch missiles over Europe—Steve Rogers has summoned the Hydra council. His Hydra council. And his plans to dominate the world can finally begin.